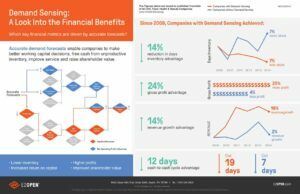 Demand Sensing: A Look Into the Financial Benefits - E2open | Demand. Supply. Delivered. Discover the financial benefits of the accurate forecasts generated by demand sensing applications. From reduced inventory to revenue growth and more, this infographic shows how demand sensing makes a dramatic impact.